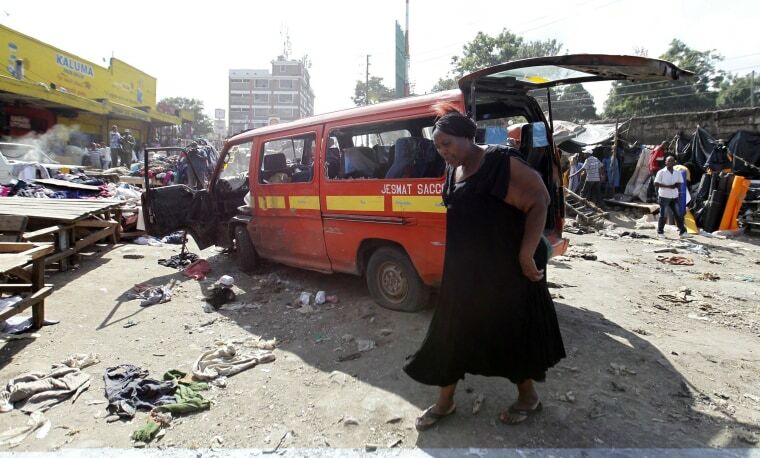 Ten people were killed and approximately 70 injured after two explosions hit a market in the Kenyan capital Nairobi on Friday, officials said, just one day after the State Department advised against non-essential travel to the country because of continuing terror threats. The official Twitter feed for Nigeria's Disaster Operations department said the first blast originated from a "matutu" - a public transport minibus - and the second came from within Gikomba Market. It said Kenyatta National Hospital was on standby for casualties. The State Department updated its travel warning for Kenya on Thursday. It said: "The U.S. government continues to receive information about potential terrorist threats aimed at U.S., Western, and Kenyan interests in Kenya, including the Nairobi area and the coastal cities of Mombasa and Diani." The warning said that this year alone more than 100 people in Kenya had been killed in "numerous attacks involving shootings, grenades, or other explosive devices." Fire fighters on the ground responding to the GikombaBlast Via @franklinwambugu pic.twitter.com/Rly12zPZPX"
On Wednesday the U.K. Foreign Office also issued a warning against all non-essential travel to all areas within 37 miles of the Kenya-Somali border and Nairobi. Tour operators Thomson and First Choice canceled all flights to the country until October and evacuated about 400 tourists to the country as a precaution.